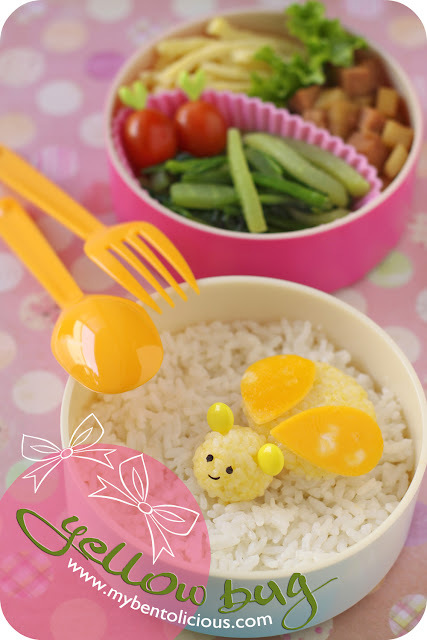 Yellow bug for today's bento because this morning started with a cloudy day again and we miss Mr. Sun somehow. The weather like this it just made us wanted to tuck under our blanket and have a few more hours of sleep. We will probably do that tomorrow since the weekend is coming (yeay!). We still have a lot of rain pouring over this week and probably next week too. So the temperature has been nice, not too hot and too stuffy. No special plan for our weekend but we will enjoy it and I wish for all of you too ... Have a great weekend with friends and family! Such a cute little bug! Love your creativity Lia. Have a great weekend ahead! so sweet of yellow bug...! Love the cheery colours. Have a great weekend! I have those dot picks, and I never used them because I can't think what to do with them. But now, I'm using them for ears. Hehehehe! You are so creative Lia! Love the cutiebug! @sheri fujihara Chen : Thanks a lot Sheri! I only can think to use them for ears or bug's antenna. Have to ask the kids, sometimes they can think of something that we never thought about it :) Wish you a great weekend ahead! i love your cute bug! When it rains, little kids here would sing "rain rain go away, come again another day" so they could play! @Mrs. P : Thanks a lot Mrs. P! Sadly to say that it's very hard to find playing parks for the kids in Jakarta. So they play a lot inside the house or at the backyard. I am wishing for some rains coz it is just too hot here! Cute little bug and love the yellow color too. Hope you´ll still have a great weekend ahead! Oh he's so tiny and cute! Too bad he'll get eaten soon (if not already). hehe. No plans for weekends= oh yeah! Happy weekend Lia! Thx for your always happy comments on my blog. : ) Always makes me smile.. Cute little bug! Cheerful bento to finish this week! Have a good weekend!